This guide aims to help you get the 0x80240fff error code solved and successfully update your system. Below you will find some tested solutions that may help you solve the problem in Windows 10 Home and Pro version. “I tried to do a clean boot for updating Windows 10, but it just failed to update and got error code 0x80240fff. What can I do? According to Microsoft experts, this code may occur in the case that the Product name of the custom content is the same as an existing Category name. Let’s say you create a product within SCUP which you name “Record”. This may confuse the system when evaluating the categories because you may have an update classification also called “Record”, which has the same name as the product you created. Fixing that issue has several possible options. However, it depends on which version of Windows 10 you are using. Here we will offer you all the tested solutions that are known to have helped to users with the 0x80240fff error code problem. From the menu find Windows Update Settings then click on Advanced Options. At the end of the page that will open, select Defer Upgrades as shown on the picture. 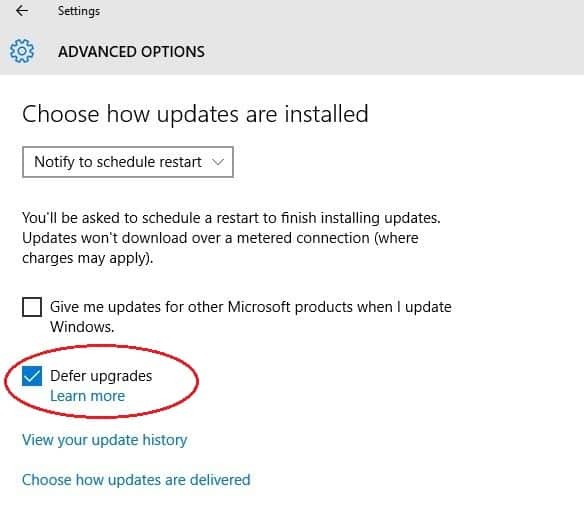 By doing this, your problem should be fixed, but bear in mind that your updates will be postponed because this will change your Windows update server. You can download the latest Windows 10 updates on your machine with the help of the Media Creation Tool. Simply choose to upgrade and Windows should perform that automatically. In the home version of Windows 10, the Defer Upgrades option is not available. That’s why a solution that may solve the error is to download the Media Creation Tool. This could be done from the link here. Simply follow the instruction in the tool to solve the issue. 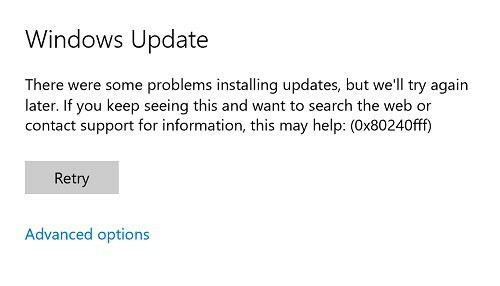 Once you open the Windows Update troubleshooter, simply let it identify the problem and follow the offered fixing steps. Firstly, press the Windows key + R to open the “Run” box. Then type services.msc in the text box and press Enter. Select Background Intelligent Transfer Service (BITS) from the list that appears. Then, click the right button of the mouse over the Background Intelligent Transfer Service (BITS), and select Properties. In the General tab, next to Startup type, check if the Automatic (Delayed Start) is selected. If it is not, then select it and then click the Apply button. Next to Service status, check if the service is started. Click on Start if it is not. This should solve the problem. We hope you found the solution that worked for you in this guide. In case that you are still facing the issue, please leave us a comment. If you know another way that also works to solve the 0x80240fff error, it would be great if you share it as well.